Description: Standard Manufacturing DP-12 Shotgun 14rd Cap Blk Standard Manufacturing Company has raised the bar with this extraordinary shotgun that truly is one of kind that was manufactured in a state of the art facility. The innovative design and guaranteed functionality is well ahead of its time. Extreme detail has been a priority from conception through production of these double barrel repeater shotguns. The first of its kind, a premium defense, double barreled, pump, 12 gauge shotgun that quickly fires 16 rounds. Designed for the most discerning shooters who demand extreme firepower and require consistent reliability. The stock has a QR code you can scan with your smart phone or tablet to down load the manual and other information. Please be sure and fill out the warranty card and send it to Standard Manufacturing. The spreader choke tubes are designed to shoot a devastating pattern at 25 yards. The choke tubes have Tru-Choke thread patterns. Some pictures show door breachers, these are sold separately. 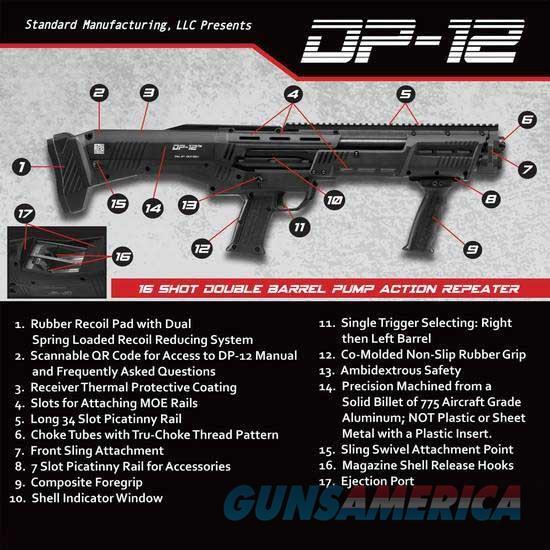 The DP-12 provides accessory rails and slots that allow you to customize it with your own accessories. Specifications and Features: * 12 Gauge * Fires 2 3/4 or 3" shells * Two 18 7/8" barrels * 29.5" overall length * Unloaded weight is 9 pounds 12 ounces * 16 Round capacity, 14 rounds in the magazines and two rounds in the chamber * Two shots with each pump * Single trigger * Machined from aircraft grade 7075 aluminum * Thermal coated receiver * Inline feeding * Ambidextrous safety * Ambidextrous pump slide release * Two Picatinny rails for accessories; seven slot rail on the bottom by the foregrip and a 13.75" 34 slot rail on top * Co-Molded non-slip rubber grip * Slots to attach MOE rails * Shell indicator window * Shock absorbing spring loaded recoil mechanism * Synthetic stock * Rubber recoil pad with dual spring loaded recoil * Both barrels include spreader choke tubes with Tru-Choke thread pattern * Choke tube wrench * Heavy duty lock * Instruction booklet and warranty card * Composite foregrip * Front sling attachment * Sling swivel attachment on stock * Erogonomically designed to balance the weight of a loaded gun for quick and efficient handling with minimal recoil. The firearm that you will receive will be Factory New and Unhandled (NIB). We do not operate a Petting Farm. The photos may be file & catalog photos representative of this item only. NO TRADES PLEASE. Faxed or E-mailed signed FFL’s are acceptable. Alaska & Hawaii Please e-mail before bidding for shipping costs (Long Guns Only). Credit Cards accepted plus 3%. NO SALES TAXES COLLECTED = TAX FREE NEW HAMPSHIRE. Please check your local and state laws before purchasing.